It began as a normal day for the Man of Steel. A simple rescue, a television interview, a patrol of the city. It would not end normally. Deep underground, evil is stirring, rising, setting foot upon the ground, setting the stage for the greatest tragedy in the DC Universe since the Crisis. Beginning with an idolated rampage, Doomsday attracts the attentions of the Justice League, the media, and finally, fatefully, Superman himself. And as the battle rages on with no end in sight, the world prays in vain for its hero. As Lex Luthor tries to hold Superman responsible for the creature, Doomsday decides to go to Metropolis, completely unchecked despite Superman's desperate actions. Nothing save one final, desperate sacrifice. And when the final blow of this battle is struck, Superman is simply... no more. As his loved ones and friends grieve silently, the world weaps openly. And as the Kents, Lana, and Lois struggle not to fall apart, Luthor and Cadmus struggle with the police and each other over the hero's body. Only Supergirl and Lois can bring an end to the conflict, but a much larger one looms ahead... One greater than Doomsday. Suffering a heart attack, Jonothan Kent is granted one chance to save his adopted son from death. Using his love, he valiantly strives to rescue Clark in the afterworld. He apparently succeeds, and awakens, saying that Clark is back. But this announcement is only the opening volley of a potentially tragic mystery. A man saved by Superman becomes a hero to honor his memory. A clone from Cadmus escapes and tries to capitalize on his powers and newfound fame. A half metal man claiming to be Superman begins patrolling the planet. And a caped man in a visor deals out swift, brutal, Kryptonian justice. Story - 5: This novel not just retells the classic saga of the death and rebirth of a hero, it streamlines it. While we lose such things as the birth of Parallax, a direct result of the true villain's actions, and the underdwellers, what we get in exchange is a much more focused story, one that gets to the core of the near-tragedy of the entire affair. No character gets the short thrift here. Luthor's scrambling to conquer Superman in death, Supergirl's hope that Superman could be alive, Lois brilliantly deducing a critical truth about one of the Supermen... It all works, perhaps better than it did in the comics. 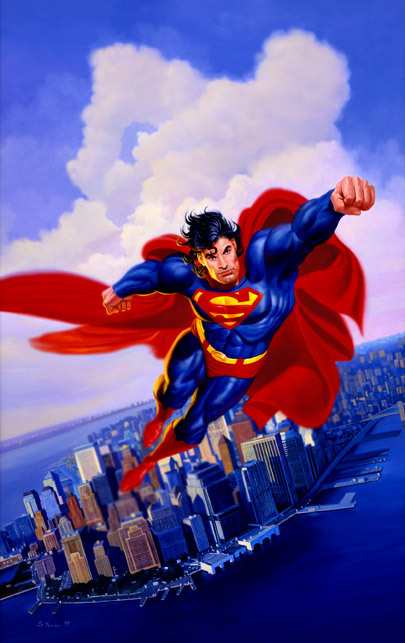 Interior Art - 4: At the front of the book is a stunning image of Superman, with his longer hair, flying above and away from Metropolis. Its placement, however, I take issue with, if only because such a triumphant image belongs at the END of the book, not at the beginning. Annoyingly, the only reason I know who DID the artwork is that the artist signed it in the bottom left corner. 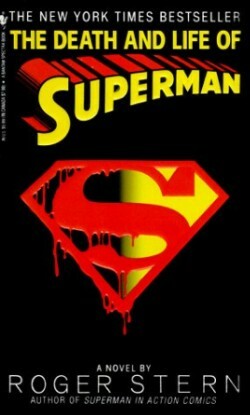 Cover - 5: Plain black with the simple, stark image of the classic S symbol bleeding. It screams "BUY ME!"